Nestled in the foothills of the Blue Ridge Mountains, Tryon, North Carolina enjoys breathtaking vistas that include horses as well as mountains. An equestrian culture and lifestyle drove the development of this small town to become a model for community-based horse trails. In 1925, Carter P. Brown, an inn keeper and horseman from Michigan arrived in Tryon and decided it was a good place for horses. He founded the Tryon Riding and Hunt Club (TR&HC). 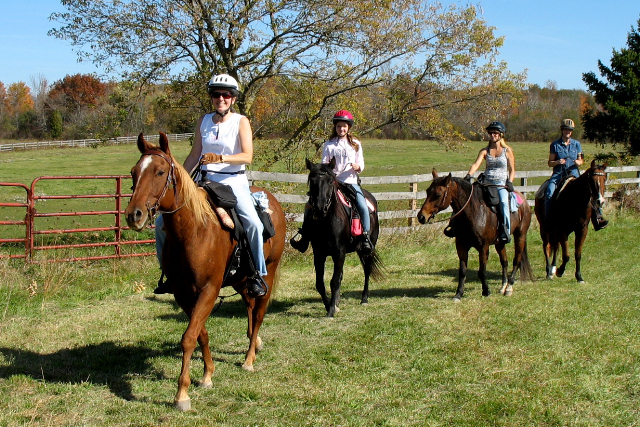 The club organized horseback rides, picnics, and equestrian competitions. TR&HC also helped develop and maintain hundreds of miles of trails used for fox hunting and by local equestrians. In 1946, Brown organized the first steeplechase in Tryon, the now famous Blockhouse Steeplechase. In 1956, TR&HC was instrumental in recruiting the United States Equestrian Team to train in Tryon at the Cotton Patch as they prepared for the Stockholm Olympics. It was through Carter Brown’s leadership and TR&HC’s organized activity that Tryon cemented its now historic equestrian core. In 1990, an influx of new people, many of whom had little knowledge of horses, began moving into the horse-centric community. The gentleman-farmer understanding of allowing neighboring horses to access their lands began eroding as new developments crowded in on farms. At the same time, concerns about liability increased as people unfamiliar with horses considered the risk implications of sharing their lands with trail riders and fox hunters. Recognizing this risk, the Foothills Equestrian Trails Association (FETA) was formed to maintain trails for use by Tryon’s horse community. FETA’s voting members are landowners committed to keeping trails open on and across their property. The organization is governed by a 12 member board and raises about $55,000 in dues every year, allowing the organization to provide liability insurance to protect landowners involved in the trail system. In recent years, a FETA committee has worked to obtain trail easements to ensure that the trail system will be protected for generations to come. At this writing, approximately two-thirds of the trails are protected by trail easements, including all of the critical core and connector trails. “We have 189 land owners and our membership runs between 250 to 500 members. The rules for our membership are designed to promote safety on the trails and risk management for our land owners. Without the trust and support of the landowners, FETA would not exist,” said Judith Kerns, President of FETA’s Board of Directors. The cost of purchasing liability insurance is approximately 25 percent of FETA’s annual budget. In addition to purchased insurance, FETA relies on state recreational use and equine activity statutes as a part of their risk management strategy. FETA holds two events per year- one to welcome new members in the spring and an annual membership meeting held in the fall. They publish a quarterly newsletter and use a voicemail system to record daily trails status updates. Notably, FETA does not publish or post its trail system map. New members may view the map at the spring or fall gathering and are encouraged to learn the trails by riding with existing members. By limiting access to the trail map, FETA safeguards its landowners from risks associated with access by non-members. “Trail sections are observed and opened and closed daily as conditions dictate. Due to uneven rain patterns, some areas may be saturated while others remain dry enough to safely ride,” said Kerns. A Facebook page also provides notifications of trail closings due to safety issues, trail construction or damage. Riders are still required to call the FETA Trail Status line just prior to their ride to get the most current trail closing information. Strong and long-term organizational efforts by FETA TR&HC and have effectively protected and grown the community’s equestrian assets while safeguarding the important economic driver for the region provided by Tryon’s horse community.